The following uses for palladium are gathered from a number of sources as well as from anecdotal comments. I would be delighted to receive corrections as well as additional referenced uses. Palladium is perhaps a more affordable metal than platinum and gold. Palladium is one of the whitest metals available for jewelry. 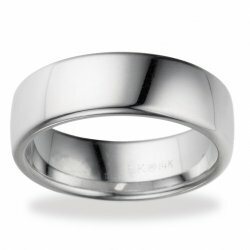 This is a palladium wedding ring supplied by Superior Wedding Rings. It is palladium PD950 (95% palladium 5% rhodium).